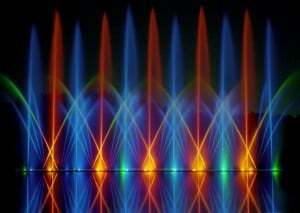 Since the 1920’s, our family business has been dedicated to creating custom dancing fountains with music and lights. We are the world leaders, with over 70 years of industry experience and a team that is dedicated to providing an outstanding service. Every show is tailored to the clients’ needs, so whether you require a graceful, balletic display or a fast-paced, exciting attraction, we have the solution. Venues all over the world have been transformed by our memorable shows and they bring in large crowds to all kinds of businesses, including shopping malls, restaurants and theme parks. There are countless colours and routines to choose from, making them truly unique. Each display can run for months at a time with little to no service required, meaning they never miss a beat. The majority of our installations are in pools, however shows can also be floated in lakes, on a barge or set on their own platform. Custom dancing fountains look spectacular indoors and outdoors as we are the first company in the world to include high-tech dichroic filters as standard equipment in fountain displays. These provide saturated colors that are up to four times brighter than ordinary fountain lighting. Our shows have many commercial applications but since everything is customisable, all of our fountain series can also be sized and adapted for home use. Our unparalleled level of quality has gained our family business a fantastic reputation!